Pinar Toprak Scores Pixar’s PURL – Watch it now! SPLIT’s West Dylan Thordson scores M. Night Shyamalan’s sequel film GLASS, digital soundtrack out Jan 18. Short Suites Represent Short Film Scores in New MSM Soundtrack Release – fantasy, drama, horror, sci-fi, more! Reintroducing HELLBOY – with Benjamin Wallfisch settling the score. Larson’s November Soundtrax column features interviews with Winifred Phillips andDavid Buckley – plus a number of genre-associated album reviews & news. September Soundtrax column features interviews with Sean Murray (DEEP BLUE SEA 2) and Rael Jones (HARLOTS), reviews of THE PREDATOR, BATMAN NINJA, COLOSSUS THE FORBIN PROJECT, more. Link to the column here. Giant Reptiles on the Rampage! Strange Creatures Out of Time & Space! Haunting Hybrid Rhythms And Riffs! Meticulous Commentary on Thousands of Film Scores! Exhaustive Historical Analysis Of Genre Film Music! Massively Expanded New Edition Of A Classic Film Music Book! Musique Fantastique II, Book I: 2012 Rondo Award nominee! This thoroughly re-written and massively expanded new edition of Larson’s seminal 1985 book will be spread over a landscape of four large volumes, covering every aspect of music for fantastic films from the Silents through the Summer Blockbusters of 2011. Focusing on the composers whose work has enlivened the movies of monsters and madmen, fantastic lands and distant worlds, Larson analyzes fantasy, science fiction, and horror film music around the world, from A TRIP TO THE MOON in 1902 to TRANSFORMERS: DARK OF THE MOON in 2011. Eschewing criticism for commentary, Larson incorporates interviews with hundreds of composers along with his own perceptive analytic commentary and the perspectives of a myriad of other reviewers, writers, and commentators, providing in Musique Fantastique, Second Edition a comprehensive historical overview of how music has been used in the fantastic genre. Totaling 34 Chapters and more than 1700 pages, featuring a new introduction by film composer Christopher Young, Musique Fantastique, Second Edition offers a definitive historical context for the evolution and development of film music within science fiction, fantasy, and horror cinema. Book One now available from Creature Features. By Randall D. LarsonMusic for science fiction, fantasy, and horror films has always been a particularly unique area of film scoring. Just as fantasy has allowed the minds of writ­ers and filmmakers to flow into new and unexplored regions, so has it allowed the imaginations of film composers to create much of the finest music composed for motion pictures. 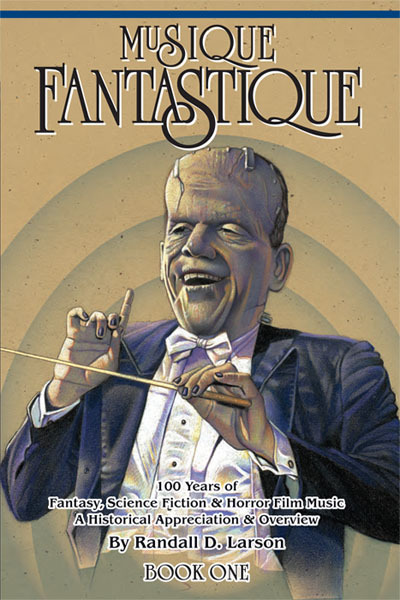 In 1985, Randall D. Larson’s Musique Fantastique was the first book-length analytical commentary of these genres of film music. In this new edition, Larson has thoroughly rewritten and expanded that book into a massive comprehensive examination of music for fantasy, sci-fi, and horror films and television, from the silents through the summer blockbusters of 2012. Intricately detailed and wide-ranging in its scope, Musique Fantastique 2 is presented in four books spanning some 1700 pages.“I would like to thank Randall on behalf of the entire music community for his years of commitment to promoting film music and the film composers that write it. Most importantly, he has always done it entirely out of true love of music and what it can do in these kinds of films. It’s been this passion for genre music that prompted [this] analysis and commentary.” – from the Introduction by Christopher Young.One Book – Four Volumes – Encyclopedic Commentary – Essential ReadingBOOK ONE Now Available from from Creature Features.